Enhance your child's younger years by providing them with the equipment that can compliment their individual needs. Kettler® swing sets can help kids develop strength and coordination, and at the same time, encourage children to play outside while at home. They also provide a great social environment for children that want to get together and play with their friends. This means you don't have to make time in your schedule to go to the park or be concerned about them being away by themselves. Swing sets can provide your child with hours of play while providing you with a great way of incorporating fitness into their playtime. Kettler® swing sets are designed for safety and fun. As Europe's leading manufacturer of quality Children's Metal Swing sets, Kettler® performs several steps that are uncommon in the industry. Kettler® manufactures in house, rather than purchase, all of the steel tubing that has a 1.2mm wall thickness, internal and external anti rust treatment, and the highest quality polyester powder coat finish. Kettler® swing sets will last through multiple generations of fun. The optional accessories available for the Kettler® swing sets will allow you to customize your play area according to your child's needs and abilities. 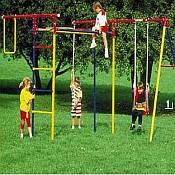 Accessories will also allow you to add or change the swing set as your child grows. You can move from a Baby Swing seat to a Deluxe Board seat, or even add the Surfboard as your child becomes more courageous. Adding optional accessories will allow your child to carry their creativity outdoors and provide exercise for both their body, as well as, their imagination.